Many homeowners throughout Texas choose pendant lights to display above their kitchen island. 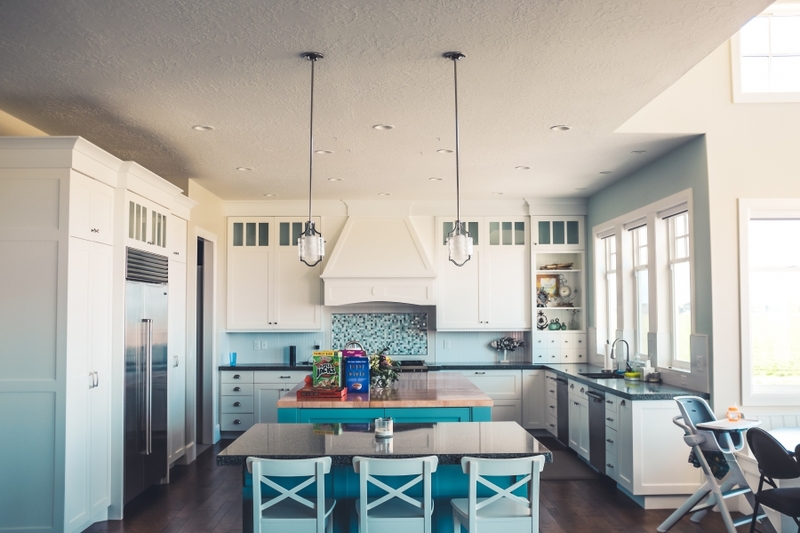 Pendant lights can come in a wide array of decorative styles, and the type of illumination you need from your pendant will depend on the lighting styles already built into your kitchen. For this reason alone, it may be wise to start considering what type of functional lighting you want to achieve. A kitchen with large windows may not need much more ambient lighting during the day, but you may want to consider task lighting above the counter for chopping and cooking needs. Pendant lights can come in a variety of shapes and forms, and in this blog, we’ll look at each of them. At M&M Lighting in Houston, we’ve provided Texas residents with some of the best lighting options and services for more than 50 years. All of our lighting consultants have completed the certified lighting training from Lightolier and the American Lighting Association. 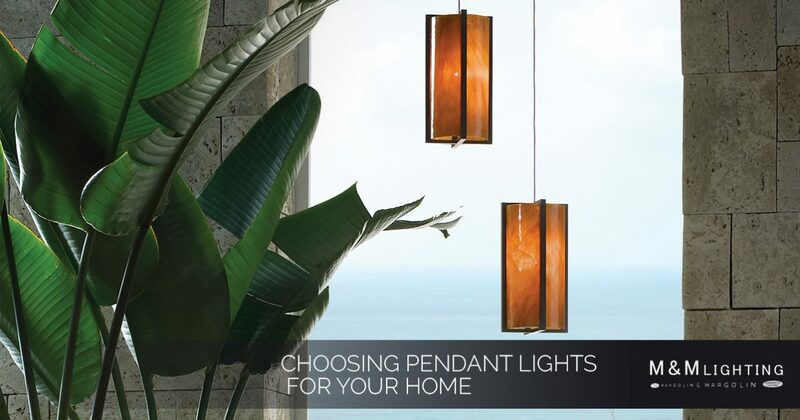 If you’re looking for pendant lights to hang in your kitchen, entryway, or bathroom, contact our professionals today or browse our catalog online. When shopping for pendant lights, you’ll notice that there are a variety of shapes and styles available on the market today. Pendant lights with shades that point up, also known as uplights, are designed for ambient lighting. Pendant lights that feature shades pointing down, also known as downlights, can be great for task lighting in the kitchen, bedroom, and bathroom. Let’s look at some popular pendant lights below! Mini pendant lights can be used by themselves or with a group of lights for task and ambient lighting. When you install multiple mini pendant lights in a row, you can create a unique interior design. Another benefit of these lights is that they can provide direct, bright illumination of particular task areas. You can install a mini pendant light above your bathroom sink, above your office desk, and even above a breakfast bar or kitchen island. This type of pendant light has become a very popular option among Texas homeowners and interior designers alike. Glass pendant lights offer a functional and versatile lighting choice that can be used virtually anywhere in your home. From the kitchen to your master bedroom and dining room, these lights can add style and functionality to any room in your home. These fixtures are normally used to direct light to a specific area, and many interior designers use them as a stylish accessory to decorate a room. When you install a cone or drum pendant light in your home, you can add elegance and style to any room. Pendant shades come in a wide selection of shapes and designs, such as double shades, cylinder, and cube shapes. These lights can add ambient lighting to your bedroom, kitchen, and family room, and you can mix-and-match the shades as you experiment with different colors and styles. At M&M Lighting in Houston, we offer a unique array of pendant lights at our lighting showroom. Whether you’re shopping for large pendants, multisystem pendants or crystal pendants, we’re confident you’ll find the perfect fixture for your home. If you’re looking for pendant lights to display in your home’s entrance, lobby, or hallways, consider investing in lantern pendant lights. These lights are traditionally made of a metal cage that is surrounded by glass, with the light source inside. A chain is normally used to hang the pendant from the ceiling, as well. Many homeowners throughout Houston like to decorate their kitchen with linear pendant lights. These are one of the few light sources that are attached to a single canopy, which can create a stylish and decorative light source in virtually any room of your home. The most popular way to use these lights is to hang them over your kitchen island. As you may have guessed, drum pendant lights are made to emulate a drum. Most lighting manufacturers use fabric, glass, wood, metal, and other trendy materials to create different shades. Some people like to dress up their drums with additional accessories like crystals and fringe, which can make a pendant light appear more contemporary than most traditional models. Pendant lights are ideal for general, task, and mood lighting. Often placed over a kitchen island, dining room table, or billiard table, these lights can add style and elegance to your space. When it comes to your kitchen, task lighting is very important. That’s why most homeowners turn to pendant lights to hang over their island, providing adequate task lighting for cooking and chopping. Before you hang your pendant lights at just any length, try to install your pendants about 30 to 40 inches above the island surface. If you want to hang pendant lights in your dining room, our lighting experts recommend hanging pendant lights 30 to 36 inches above the dining room table surface. This will allow for maximum lighting without the light fixture interfering with your space. When it comes to your home’s hallway, the height of your ceiling should give you a good indication of where to hang your pendant. If you have eight-foot ceilings, consider choosing a pendant light that falls between 12 to 16 inches in length. If you need assistance choosing the best pendant light for your home, contact the lighting experts at M&M Lighting in Houston today!